Community radio is an extraordinary thing. It happens all over the world, has many common threads and yet every station is as unique as the community it serves. The Community Radio Toolkit is an attempt to make life easier for people setting up and running community radio stations by publishing and discussing the things that we have in common – making life easier to allow you to spend more time on the things that make you unique. 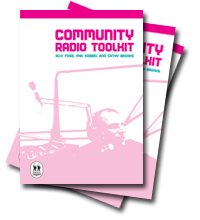 This website has a mixture of the Community Radio Toolkit book – published in 2005 – along with other resources we’ve produced more recently such as the Social Media section. Radio Regen is UK-based but a lot of what you’ll find here travels way beyond our borders – over 20% of this site’s users are non UK-based. We hope that you find the resources useful and we’d love to hear your opinions and stories. We’re looking forward to the conversations and we’ll publish the best of them. In this section we will talk you through the processes involved in establishing a community radio station, pretty much from scratch. This section gives you pointers to programming and UK law and regulation – but does not go into detail about making radio programmes as there are plenty of resources out there on that subject. Wherever your volunteers work they need supporting and this section tells you how. The chapters and resources in this section will help you manage your resources. How to make best strategic use of social media to improve your station. Toolkit produced as a result of an Ofcom funded project by Radio Regen in collaboration with BCB Radio and DigiEnable. Some stations major on advertising, others on training – whatever your station prioritises there is something in this section for you. Toolkit for delivering training, produced by Radio Regen with funding from Ofcom. In this section we deal with how to bring all parts of your community to your station. Tools to carry out audience research and assess your impact. Find out all about Radio Regen in this section.